A majority of the readers of this post would have termed themselves “Professionals” or used the term “Professionalism” to describe one of their traits. You may, and rightfully so, question the purpose of this grammar lesson. It is simply to point out that once we call ourselves professionals there is a certain conduct that is expected of us. Now there is no single rule book or bible that lays down guidelines for professional conduct. However, it is common practice for various associations, societies and bodies that represent groups of professionals to define a “code of conduct”. Often though the code of conduct is from the perspective of ethics and integrity and not as much about the softer aspects of behaviour. Sadly, while considered implicit there is little appreciation of professional courtesies. Controlled aggression, goal orientation, positive attitude, collaborative approach, leadership, etc. the buzz words of management have invariably had some or the other social nicety sacrificed at their altar. One such courtesy, perhaps the most abused is the courtesy of response. The corporate world unfortunately is full of individuals who for reasons best known to them refuse to respond. Whether it is a request for information, a meeting request, a status update regardless of the mode of communication a response is seldom forthcoming. Often these lead to an escalation of some sort and then responses get extracted. Some of us come from the “No Answer Is Also An Answer” school of thought. To those of us it is important to note that there are several nice ways of giving a response in the negative. We tend to shy away. No one wants to be the bearer of bad news. Perhaps deep down we have this innate tendency to please and a response in the negative is viewed as displeasing someone. Funnily enough not responding to someone despite repeated follow ups is not seen as being discourteous. Essentially, no response means “The answer is no but I don’t want to say as much.” The recipient or in this case the non-recipient is supposed to deduce basis the obvious hints. The old adage, “No news, is good news” obviously does not hold good. All of us, at some point or the other, would have suffered a “no response” treatment and the ambiguity that inevitably pursues. Delayed decisions, time getting wasted on follow ups and escalations nothing seems to shake us out of this no response syndrome. Going back to the proposition that we are all professionals, is it not a fair assumption to make that all of us have goals as individuals and as a part of the larger team. It is also understandable that my “work” shall have priority over what I see as “not my work or your work”. In that light, the “not now” or “not you” or “not this much” are corollaries. Response may not be a right but it sure is a courtesy that needs to be extended to all valid queries or credible requests. Now, there is some subjectivity associated there, but in a “professional” setup the context should address that. 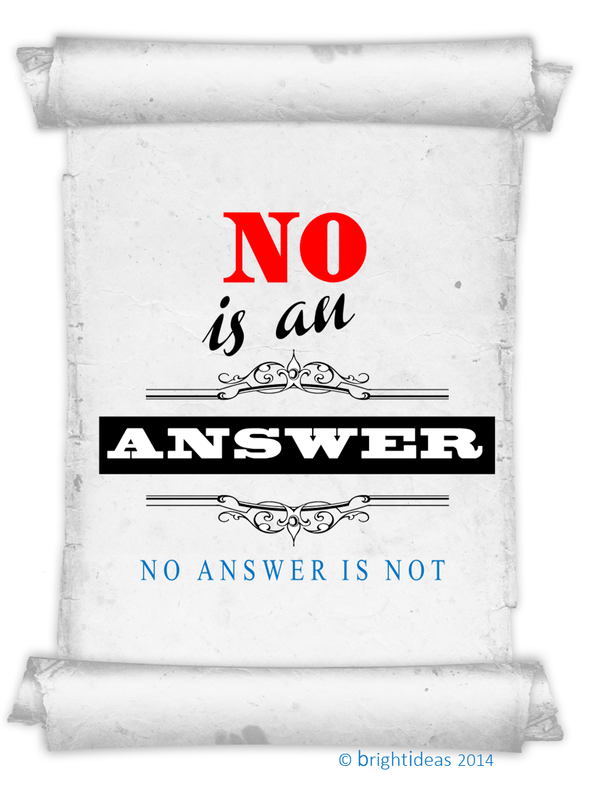 Can all of us as professionals agree that no is an answer, no answer is not?